“Al-Shamas Abdullah Zakher” founded the first Arabic printing press in Lebanon in 1734. The press is located in “Deir Mar Youhana” in “Khinshara”. The printing press operated from 1734 till1899. It was the first Arabic script printing press in Lebanon, but it was the second printing press in general since in 1610 the first Syriac Script printing press was established in “Deir Mar Antonious” in “Quzhayya” near the valley of the saints in the North of Lebanon. The printing press of “Deir Mar Antonious” was the first printing press in the Middle East. I have visited the press with my students from LAU [Lebanese American University] and took some pictures of the tools, Arabic letters and books found there. Below is a brief description of the printing process that was used back then, and the books that were printed there. More then 16 books were printed in this press starting with the book of “Mizan al Zaman” (The Balance of Time) which you can see photos of it below. It was lovely to feel and look at old printed books. The letters are de-bossed inside the paper and you can feel the texture left by the imprint of the ink. Just beautiful. The Arabic type was drawn and cut by “Al-Shamas Abdullah Zakher” himself. It is a unique type that is only present in this Arabic press. The type has humanistic rough edges and was drawn by “Al Zakher” himself. There is no information if “Al Zakher” was a professional Arabic calligrapher or not, but for sure he did take some Arabic calligraphy classes during his youth. This shows in the type he created. It somehow follows the rules of the “Tuluth” Arabic style, but it is not there yet. This is to conclude that “Al Zakher” was a great craftsman working with Arabic letters. “Al Zakher” comes from the city of “Aleppo” in Syria and he is from the renowned jewelry making family “Al Sayégh”. He has inherited the detailed crafting hand from his family, and then used this craftsmanship to start the first Arabic printing press in Lebanon instead of making jewelry. Before explaining the technical process of developing the Arabic letters, here are some examples of carved lead, metal and woodcuts used for the titles or decorations of the books. The titles were carved as one piece since the words were written more calligraphically and the letters were intertwined together. The titles were also used often in the books and not only once, so it was faster and wiser to carve the titles and not typeset them each time using separate letters. Close up on a hand carved lead word. The strokes of the chisel are clearly visible. Amazing. In traditional typography, punchcutting is the craft of cutting letter punches from which matrices were made in hard type metal for type founding in the letterpress era. Cutting punches and casting type was the first step of traditional typesetting. The cutting of letter punches was a highly skilled craft requiring much patience and practice. The punchcutter begins by transferring the outline of a letter design to one end of a metal bar. The outer shape of the punch could be cut directly, but the internal curves of a small punch were particularly difficult as it was necessary to cut deep enough and straight into the metal. In Arabic, the punches are called the fathers “Al Obahat”. The punch creates the be-bossed letter in the brass matrices. A set of Metallic Arabic letters punches. Unfortunately, you can notice that they are bit rusting due to the humidity. But you can be sure that the punches are made of metal and not lead. The matrices are brass. Sine metal is stronger than brass; the metal punch can de-boss the letter shape in the brass matrices. Arabic figures punches with wooden handle. An example of a set of de-bossed letters that were created from the punchcutting process described previously. In Arabic, the de-bossed brass letters are called The Mothers “Al Omahat”. From each matrice several lead letters will be created. The matrice will be placed unto the letter frame mold to create the lead letters. 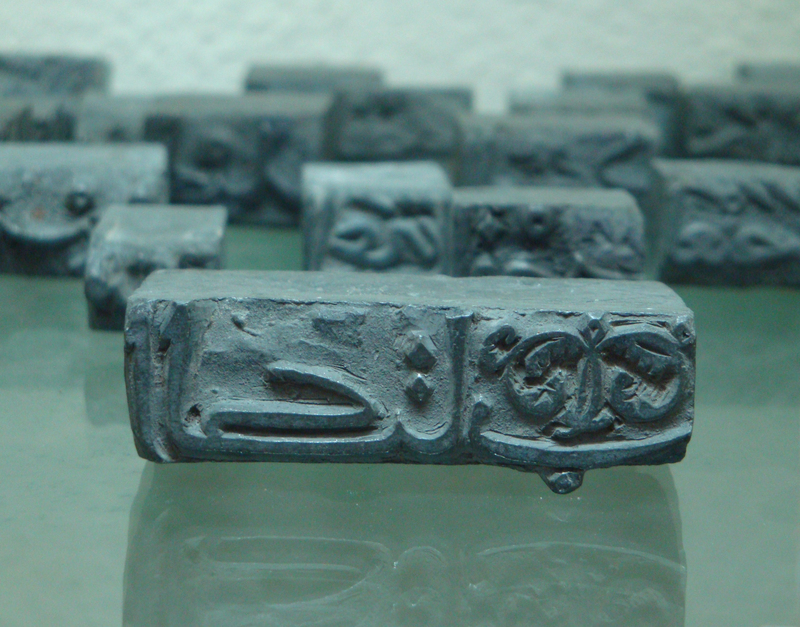 This is the Letter Frame Mold that was created by “Al Zakher” to cast the lead Arabic letters. Notice the upper opening of the mold where the hot lead will be poured in. Notice how the curved metal string on the bottom part of the mold holds the letter matrice in place. Lead will be poured into the mold and the Arabic letter cast will be formed which are known as Sorts. The mold opened and seen from the inside. A composing stick is an instrument used to assemble pieces of metal type into words and lines which are later bound into a forme, set in a galley and printed. An example of a wooden composing stick that were created by “Al Zakher”. A Composing Gally is used to arrange all the sentences to make the layout of the page that will be ready for printing. An example of a wooden galley created by “Al Zakher”. Notice that most of the tools were created from wood and not metal. This is the prove that the tools were created by “Al Zakher” himself in his workshop in the monastery and not imported from europe. The ink was also created locally by “Al Zakher”. Below are examples of ink spreaders that were used to spread the ink evenly on the letters before printing the page. The first press that “Al Zakher” created. It is a simple press made of wood and metal. The below is the second press that “Al Zakher” created. That was a brief article about the process of traditional metal type printing with images from the first Arabic printing press in Lebanon; “Al Zakher Press”. p.s. The printing press can be visited daily in the monastery. Oh, I like the idea of this blog, I wonder if the design of it though could show some nice samples of arabic typography?? or some arabic elements? This blog is from wordpress. so i am obliged by the layout and design of the page. i can only change in it the header. i am always changing it. sometimes there is arabic elements in it, and sometimes not. Pingback: Media Cetak Timur Tengah Pertama | Panduan Kaligrafi | belajar kaligrafi, contoh-contoh, dan sejarah. Termasuk perjalanan para kaligrafer. This is excellent, Pascal. Thank you so much for posting these pictures. Note, however, that the matrices cannot be lead: if they were they would distort in contact with the hot lead used to cast the type. Most likely they are brass, which is the usual metal used for matrices. Thank you, Pascal. Fantastic article. The photos are stunning, and the provenance fascinating. Great find and lovely description and great pictures. I hope to be over some time in the future so that you can take me there, too. Regarding the typeface, I have some remarks. You write that is was inspired by the handwriting of “Al Zakher”. Do you have information about this, for instance an oral tradition in the monastery, or even better, surviving notes? My impression is that this typeface is essentially an attempt to mechanize Thulth (ثُلْث “one third” a name that was adapted to in Ottoman Turkish as ثُلُث Sülüs , hence borrowed back into Arabic as Thuluth). A style like would typically not be used as personal handwriting, rather Ottoman ta`liq or (proto-)ruq`ah would typically be a Lebanese hand. At best one could say that it was Al Zakher’s personal take on Thulth. Another observation I have is that Al Zakher does not seem to have been a calligrapher in the sense of the standards of his day. While the compromises he makes in his typeface are understandable and forgivable, the calligraphic header on your sample page must have raised some eyebrows among contemporary Islamic calligraphers. For instance, from the Lam-Alef shape one would conclude that it was, like the typeface, done in the Thulth style, but the closed Waw’s contradict that in a way one would see today in, say Pakistan, but not easily in the Ottoman domains. Are you aware of more such calligraphies, or have you been able to trace local a script tradition from where Al Zakher may have taken his inspiration? Anyway, excellent report, many thanks! WOW! That’s a lot of information! How did you learn all that may I ask please? I am still learning basically Arabic so the more information I can gather the better :D I know that there are different scripts used in various areas/time periods but I really wasn’t aware that it was this distinct. Thanks for any information you can provide. Also IF by chance anyone knows where I can locate even just the letter fey, which is how I stumbled onto this blog, as a metal punch, please let me know I really want it for personal use. Thanks! The matrices were made of Brass and not Lead. Small correction. The calligraphy doesn’t look Pakistani, but rather like the uninformed calligraphic attempts produced by Europeans in the 17th and 18th centuries. Almost identical Thulth-based typography, with very similar “calligraphy” can be found in Joseé Balagna’s L’imprimerie arabe en occident (XVIe, XVIIe et XVIIIe siecles), for instnce on page 39. Thanks Thomas for your thoughts about the type. Well “Al Zakher” was not a professional Arabic calligrapher but a great craftsman. There is no info to tell on what he based his type, and the fathers in the monastery told me that he did everything by himself and he did not get anything from the west. The people who tried to take over when he was dead bought a German metallic printing press and some other tools, but that much later, and then the press closed. It is hard to get detailed info about the type from the monastery. but i think your thoughts might be in place. He might have been trying to create a Thuluth type that will work with the hot metal press system. Since he did not have an Arabic calligrapher working with him. He had to draw the type by himself with his own skills in Arabic calligraphy. I informed the father in the monastery that i will be coming once again with a professional high-resolution camera to take more detailed photos of the books produced. Great job Pascal. We need to start documenting what we see or else it will wither with age. The monastry has done a good job too. I would love to go up there with you when you make your second visit. we will plan another trip up to the monastery. The pictures are absolutely fantastic!!! Thanks, Pascal. Your pictures and description are just fine for most of us who would probably never visit the site. >>“Al-Shamas Abdullah Zakher” founded the first Arabic printing press in the middle in 1734. Not to reduce Lebanon’s prominent role in Arabic printing then and now, but I recall from my early school days in Iraq, that the first Arabic printing press was in Aleppo, Syria. The database below confirmed my believe, but who knows. It listed first Arabic printing press in 1706 in Aleppo, Syria. It also claimed that the first Turkish printing press in the Ottoman Empire went into service in 1729.
referring to pages 65-67 in the “Arabic Typography” book. it is interesting to know though that “Al Zakher” was working in the aleppo press and then he moved to lebanon and founded the press in Dar mar Youhana. but the story that the father told us in the monastery is different. what the father told us that “Al Zakher” before making the press and was working with type, he was just an engraver and craftsman. That he worked on the engravings of the church in the monastery for several year before he got the idea of starting the press. he was responsible for the craving on the “iconostas” in the church. He told us that “Al Zakher” fled from Aleppo because of the christian prosecutions over there. and that he is from a jewelry craftsman family, and that is from where he got with engraving skills. so maybe “Al Zakher” press is the first Arabic printing press in Lebanon, and not in the whole Middle East. but then if this true, i shall inform the monastery about this info and for them to correct the published books they have about the press, and to correct the info of the guides/fathers who speak about the history of the press to the visitors. Saad is right. Aleppo beats dayr mār yuḥannà as the first Middle East printing shop by 28 years. For those interested, I uploaded Miroslav Krek’s chronological index to his famous “A Gazetteer of Arabic Printing”. There were 200 copies was produced in 1977, I have nr 89 in my library. This is a very interesting site. I would only point out that some of the punches shown are tools for bookbinders rather than punches for making matrices for type-casting. The type-mould shown was probably an import, it’s unlikely that any Lebanese craftsman at that time could have made one. The second press shown is definitely a bookbinder’s press – it could be 18th century but 19th century seems more likely. The first press is very much a home-made affair, with the screw taken from a bookbinder’s standing press like the second one. Whether it is al-Zakher’s original press is more doubtful – all the metal parts have a 19th century appearance; in 1734 the platen and screw would much more likely have been made of wood. But this does not detract from the significance of the collection as a whole. Thanks Pascal, one wishes to see more of each item, particulary scans of the printed pages… perhaps on a website dedicated for this treasure of Arab culture. You might wish to correct the passage where you talk about punches being made of “metal, not lead/brass”. You probably mean that the punches were made of iron/steel, y’know, lead and brass are metals as well, so the upper passage reads somewhat contradictory. Thanks Pascal for a lovely article and nice pictures. My daughter Nadia who works in London England, knowing that I am interested in calligraphy and typography, brought to my attention your site and your article about the Arabic printing press in Lebanon. Your article brought a lot of found memories about my early school years in 19532-53 with three brothers. I spent two years at Deir Mar Youhanna school in Khinshara. A beautiful place. I remember well the Arabic press and all those boxes, the page of the book you showed, and I remember trying to assemble, under close supervision from the guiding priest, one line with those amazing metal letters. I like the idea of a digital camera and more visit to this place. I congratulate you for bringing this to the world. It is an important part of the history of this area of the world in which a lot of people are interested. Keep the good work. I look forward to your next article and to the digital pictures. actual my dad was also in the school there. and it was nice for em to go visit the press and also the school of my dad. Many many years ago (the seventies) i was trained in typesetting and printing, here in Montreal; now i’m a filmmaker and a film production teacher. Thank you for your excellent work in documenting traditional typesetting, in the beautiful country of Lebanon. WOW, thank you so much for posting this! Your blog is amazing! The history and culture of Lebanon is magnificent and deep. This article reflects that culture. The pictures are beautiful and helps share with the rest of the world the nature and inventiveness of the culture. I’m curious because it looks like it would have been developed for a press and because of its interesting similarity to the Cherokee alphabet and the Armenian alphabet. Wonderfull text I for sure tell about it my brother as he is interested in it. Best Regards Bukmacherzy Promocje. How is this going, i think they are successful. Any update from this? If you are looking to get some photography work done, then why not the absolute best work done? You really need to capture those wonderful events. I just had not been conscious of the various ripples and depth to this story till I surfed here thru Bing! Amazing work. with the most recent gossipp posted here. This is another no cost alternative that gives tremendous safety for your computer and data. the skies include dramatically different lighting levels. Recall, great basics help a shooter to enhance to better quantities.